Den Start in den Abend um 21:30 machen You Know?! mit engagiertem und sozialkristischem Punk/HC vom feinsten. Erst kürzlich wurde das Album „The Days Are Numbered“ über Remedy Records released und damit wurden nicht nur einige positive Reviews eingefahren. Aber seht selbst! 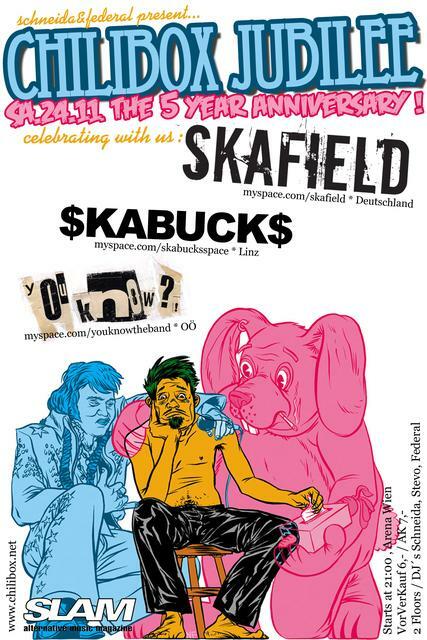 Die Skabucks aus Linz stehen für Party pur – eigentlich nicht verwunderlich bei so einer explosiven Mischung aus schnellen Off-Beat Rhythmen, eingängigen Trompeten- und Posaunenmelodien sowie straighten Punk Parts. Die Headliner des Chilibox Party Jubilees (erstmals in Wien!) kommen aus dem Saarland und werden den Abend mit ihrem „hard hitting Skapunk“ perfekt abrunden. Die Jungs sind schon einiges herumgekommen und sind derzeit bei Leech Records unter Vertrag. Ihr aktuelles Album heisst „Create your own hell“ – macht euch schon mal bereit für den Moshpit! Im DreiRaum wird es Visuals (by VJ Tony) rund um 5 Jahre Chilibox Party geben, mit vielen actionreichen und bewegten Partypics aus den ltz. Jahren! Die Aftershowparty bis in die frühen Morgenstunden findet diesmal in der kleinen Halle mit DJ schneida & federal statt (mit Punk/Ska/HC & Alternative Rock). Thanks for the details. My husband and I visited Malacca a few years ago, and I visited Penang many years ago and loved it. We were impressed by the Malaysian second homes program and plan to look into it more deeply as we approach real plans for retirement. It is refreshing to read about a good experience. Thanks for all the photos and details. I hope that your street blossoms for both residents and visitors. This is so disillusioning! I thought all the people who make and act in movies are perfect human beings. Way to shatter my innocence, “Tippi” Hedren (if that IS your real name). Since our October weather is rather “hellish” at the moment, perhaps it fits well with the overall tone. And as if time zones aren’t complex enough, those shifts this time of year serve no purpose that makes sense to me! I have to say that I don’t really relish “the decay” either. I enjoy a different perspective than all the usual “celebration” of Autumn!